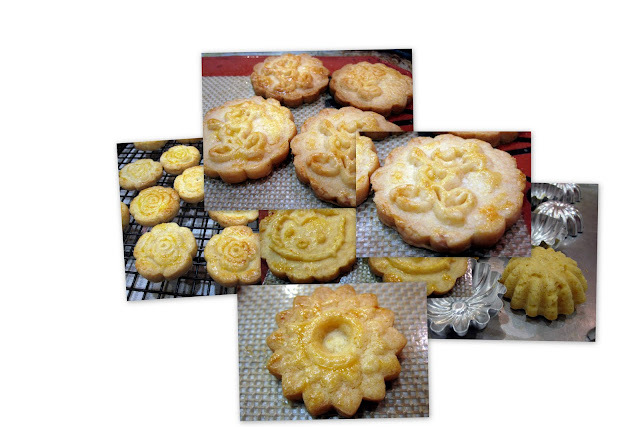 This is the time to start thinking of what cookies to bake for the coming Chinese New Year, which this year, will fall on February 14th. There are not many weekends left for baking, so it will be great to start baking this weekend. I am very fortunate to have friends who think of me and it is very timely for Julie to send me a package, containing all her new items from Biodiversityherbs.com. I loved all the cookie moulds and presses she sent and could not wait to try them out. Here are the cookies made from her cookie presses. Add in egg yolk and beat until well combine. Add in the rest of the ingredients - all purpose flour, custard powder, rice flour and baking powder. Mix until well mixed - it will look loose but when a tiny ball of dough is pressed together, it should be able to bind. Rest for 15 - 30 minutes before rolling dough out to 1/8 inch thickness and using cookie press, press out cookies and place into lined baking sheet. Bake in preheat oven 375f for 12 - 15 minutes or until golden brown.